Last Friday, the candidates for County Executive attended a forum to discuss a report by Sage Consulting listing numerous problems with the county’s economy. Afterwards, most of the Executive candidates commented on the report and on the economy more generally via email and social media. Their responses say a lot about which ones take the economy seriously, an issue that has drawn much attention from Seventh State. Council Member Roger Berliner (whom your author supports) sent out this email over the weekend. Our county has serious work to do to improve our business climate, diversify our economy, and increase the number of good jobs. It must be Priority #1 if we are going to be able to meet the needs of our school system, reduce congestion, invest in public safety, and protect our environment. I have a record that I am proud of on improving our economy and a vision for our future that you can read about here. Some of my competitors have records too. Others have just words. It’s important to consider what we have done in pursuit of increasing prosperity, not just what we say we will do. My record includes leading the successful effort to reduce our energy tax three years in a row; creating the small business navigator and a micro-loan program to help our local small businesses and entrepreneurs thrive; and playing a leading role in our Amazon bid. My vision is of a forward leaning county that embraces innovation, education geared towards the jobs of tomorrow, and vibrant urban centers served by state-of-the-art transit. Yesterday, a consultant tasked with assessing our business climate and outlook, issued a scathing report. It highlighted one startling statistic: that “between 2011 and 2016, the number of [business] establishments in Montgomery County increased by 6, or roughly the population of businesses at a strip mall.” The report concludes that “Montgomery County therefore desperately needs to step up efforts to expand its commercial tax base.” You will get no debate from me on that point. This should not be mistaken for an assertion that Montgomery County is anything other than the finest possible location for Amazon HQ2. 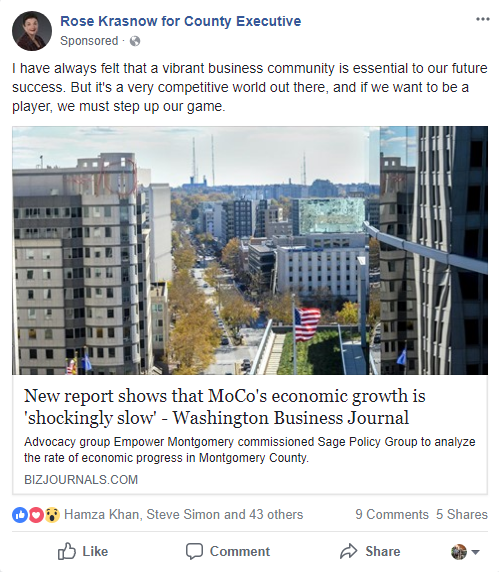 It will be difficult for Amazon to identify an area that is as open to new ideas, offers such abundant human capital, is as saturated with transportation options, supports such high quality public education, is as institutionally rich, and is as committed to shared prosperity as Montgomery County, MD. Life is good in Montgomery County, but we can make it better still. That’s my goal: a “more perfect” Montgomery County. Delegate Bill Frick (D-16) sent out this email hours after the Executive forum ended. Something doesn’t add up. How does a county with our talent, our people, our great public schools and our values lag behind the rest of our region in job growth and economic development? How is it that private sector employment has declined by 12,500 jobs from 2006 to 2016? How is it that, during that same time period, Montgomery County created on net just six new businesses? The answer is clear. As I told the Montgomery County Business Roundtable earlier today, it is our political culture. My opponents have built a political culture in Montgomery County that doesn’t want to work with businesses to thrive and grow here in our County. And if we elect someone to be County Executive who is part of that culture, things will not get better for business. I am an outsider to Montgomery County Government and yet I have real governmental leadership experience as the Majority Leader of Maryland’s General Assembly. I have the relationships in Annapolis that can help our County. 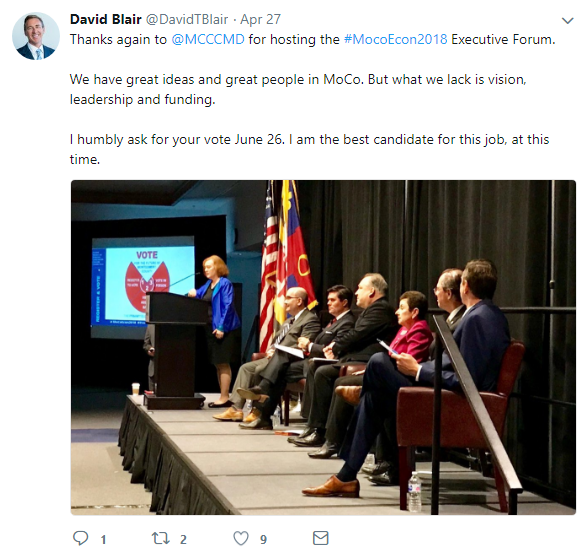 But since I am not a multi-millionaire, and unlike three of my opponents, I am not spending your taxpayer dollars to fund my campaign, I need your help to communicate with Montgomery County residents who deserve leadership that the current members of the County Council will not provide. Montgomery County is an awesome place to live. It’s why I’m raising my two children here and sending them to our public schools. But we have a problem, and that is that we must reform in order to create new private sector jobs and increase our tax base. We have to focus on the core functions of county government – education, public safety, and transportation – and those need to be our priorities for our budget. Our County Government does not need to be in the liquor business, a failed venture that is hurting our food culture to the benefit of downtown DC restaurants. We have to have a culture of ‘yes’ in county government so that we are trying to find reasons to say yes to businesses rather than find reasons to say no. Former Rockville Mayor Rose Krasnow ran this Facebook ad. 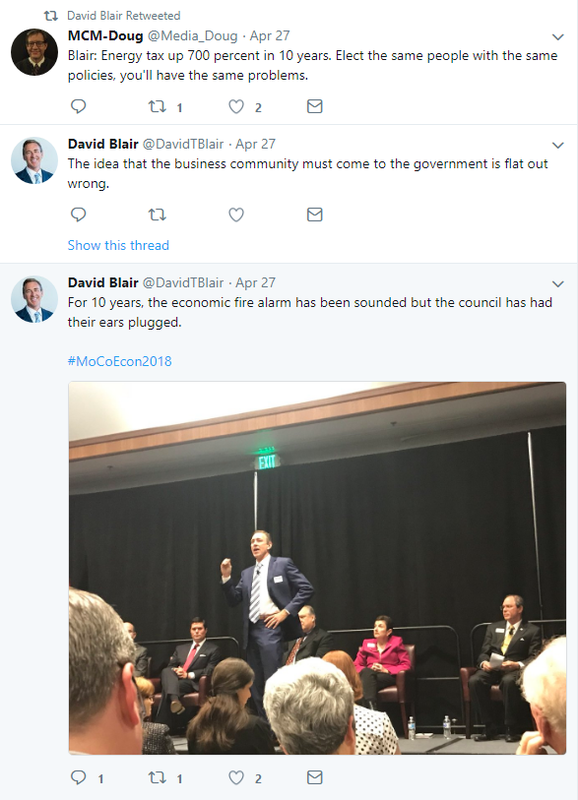 David Blair commented on Twitter. Council Member George Leventhal commented on Facebook. We are not aware of Council Member Marc Elrich commenting via email, Facebook or Twitter.